On Saturday it rained all day. So Big M and I decided to attend an estate auction. All the big time collectors were there at the start, but as the rain continued most left. Now that can be great for me, less competition. I won several low bids that day and hope to show you some of it soon. 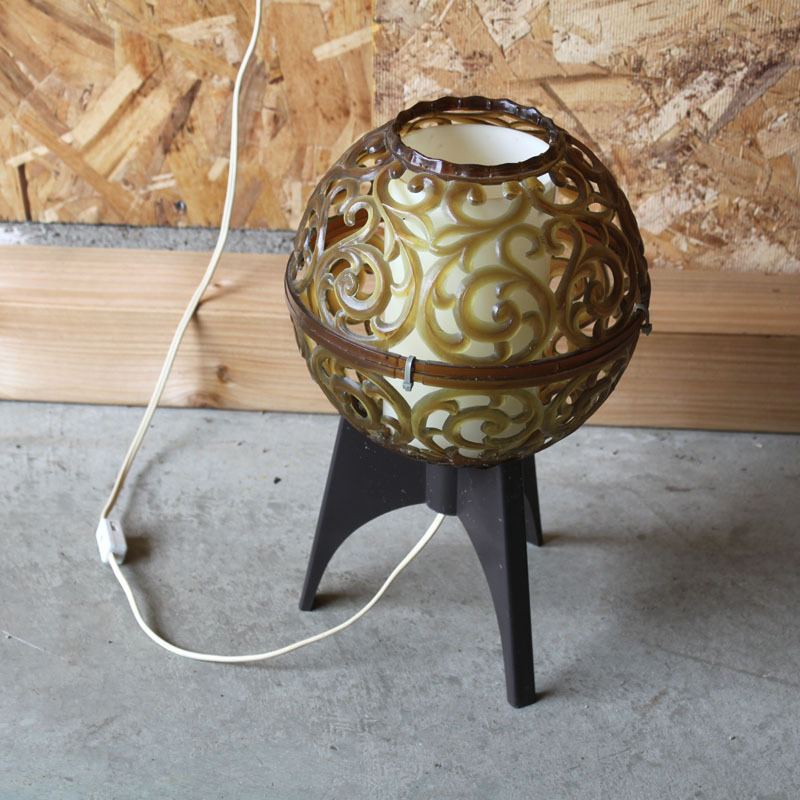 I won a box lot; one of the things in the box was this space age looking globe lamp. I was thrilled. Just look at the rocket shaped legs and the swirl globe. The first thing I noticed though was that it was plastic. Oh well, I thought it would still sell. So I plugged it in to see if it worked. Yes…it worked. I was definitely excited, so I took the above photo for my inventory records. So today I took it out to clean it up and list it. However I needed to take the bulb out to clean it well before I took the official photos for the listing. I couldn’t figure it out. No matter what I did, I couldn’t get the bulb out. I did what I normally do…waited to ask Big M for help when he got home from work. Not wanting to waste time I wrote the listing information. Big M, of course, got the bulb out immediately, but as he was doing it he noticed something that I had not seen…wire ties holding the thing together. What? How could I not even see them? I spent all that time writing up a description, looking at it, researching it and I still hadn’t seen it. Do you see one of them in the photo? My excitement turned into disappointment as this lamp went into the garbage. Oh well, I bought the box lot for something else so no loss except for a little bit of excitement and time. Does that ever happen to you…do you sometimes miss the obvious defect on your treasures?